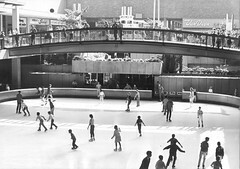 Here’s what the ice rink at Lloyd Center looked like soon after the mall was built in 1960, before they put a roof over it. Note that the lower level to the east of the rink didn’t exist when the mall opened; there are stairs leading up to the second level, which was then the main level, behind the ticket booth. If you’re still not oriented, what is now Macy’s would be to the right; the elevator and current ice rink office and concession area to the left. As I recall from my childhood (please correct me if I’m wrong), what you’re seeing to the east of the rink is a mezzanine which was removed when the mall was remodeled/covered — but there were indeed shops on the lower level to the east. You can see how the doorways to the parking garage at the east end, and the lower-level space now occupied by Marshall’s, retain some of the original 1960’s character. The mezzanine a fountain which pooled down near the lower Meier and Frank entrance (in fact, there were multiple fountains and sculptures throughout the mall which are now gone). I was fond of that fountain and also fond of the one on the upper level toward the west end, not far from what is now Nordstrom and the bridge to the Lloyd Tower. I also seem to recall that there was once a narrower bridge a level above the main arch bridge you see in the photo, but I think that was removed as part of the construction of what is now the food court and the cinemas. Skating under the stars or falling snow is a real treat. Too bad we can’t do that in Portland any more! Oh, we can still skate under the stars or in the falling snow. Just wait until a severe cold snap and Laurelhurst freezes over. I’ve spent hours skating on that pond – it is awesome, especially with the park lights. A very awesome experience. My memories of an uncovered Lloyd Center was rushing from shop to shop because it was soooo cold out and it wasn’t enclosed. Also, I seem to remember there was a restaurant overlooking the icerink – a nice one where I had to be a good little boy. I’m now in Delaware but these memories live on! Skating on Laurelhurst pond? How many times in the last 20 years has that been possible? I do recall ice skating in my driveway after the New Year 2004 snow/ice storms, but that was a freak occurrence. What the developers did was convert a section of the underground parking garage into retail space, turning two levels (main retail plus upper office) into three (lower, main retail, upper office). And apparently, this was a last-minute decision. The original plan was to relocate the upper office tenants to a new building and convert those spaces to retail, but the new building plans ran into trouble and the current tenants balked at being moved. Kekst’s suggestion was to leave the office tenants in place and create a second retail level by removing grade- and intermediate-level parking decks located beneath the poured-in-place concrete structure. "When we signed on to the job, we were face with a fully occupied project. The new lower level provided us with the space we needed to temporarily relocate existing retail tenants," explained Kitchell’s Larry Butler, senior project manager on the job. "It enabled us to get into their existing spaces and add new ductwork and whatever else was necessary to complete the job. From Simon’s standpoint, the tenants were able to remain on site without having their operations interrupted. It was a major issue because Simon had to honor those existing leases." Once seismic bracing was installed, concrete shears were used to remove the intermediate parking deck and the concourse floor above it. "Rather than cutting specific holes out of the concourse and leaving sections to form bridges, we decided it was easier to cut a continuous slot," Pattison said, noting that pedestrian access was maintained with temporary bridges that spanned from one side of the newly created opening to the other. "The bridges were movable," he elaborated. "As work progressed, Kitchell would use them to create new traffic patterns that allowed stores to remain in business." The temporary structures were eventually replaced with permanent steel-supported bridges, he said. Well, that’s what I thought! Thanks for digging that up. It’s actually amazing that it has adapted and survived so well, considering most malls of that vintage were long ago destroyed. Same category as the Memorial Coliseum (and same age), the subject of an earlier post on this blog. This first one shows the original east wing configuration, with offices up and retail on the main level. Note the planter boxes and seating on the main level — this was common throughout the mall. In the center of the planter boxes in some areas were open grates which vented the parking areas below. Here is a shot of the upper part of the mezzanine … the photographer is most likely standing on the arched bridge over the ice rink, looking east. In the right-hand portion of the photo you can see one of the rectangular ponds of the mezzanine fountain. If you look carefully to the left of the Van Duyn store, you can see part of a spiral staircase. This spiral staircase was in the east wing, it’s the same one that you can make out in the previous picture. It leads from the retail level up to the offices. At its core was a fountain lined with orange tile. The Newberry’s photo is from the lower-level north-side parking ramp, correct? We used to park near there when my daughter was taking skating lessons. Yep, I’m not sure which angle or entrance that the photo is showing (there’s more than one way to see the subterranean Newberry’s facade) — the top floors are now the Dollar Tree, and the bottom is apparently unused or storage. You used to be able to enter the Newberry’s from either street level or in the parking garage. There used to be a traffic light (positioned horizontally under the skybridge) to allow pedestrians to cross from the main mall to the Newberry’s space. This is now an unsignaled crosswalk, but with prominent markings and a wide median. One other interesting feature of the Newberry’s (Dollar Tree) building is that the skybridge on the south side is actually part of a ramp for maintenance vehicles to allow them to drive around on the roof area of the main mall! I have a friend who works for a local TV station who has told me they once went up there in a news van to get a live shot, only to discover the clearances were tighter than posted because over the years Lloyd Center crews had strung wires here-and-there, high enough for a normal minivan to clear, but not a full-size truck with a mast on top. Bob, I love these photos! Thanks for letting me trip down memory lane. I’ve never been super crazy about shopping, but I loved Lloyd when I was a kid because you could step out of the stores and get some fresh air. I was completely bummed out when they covered it — it made me go all claustrophobic. I was just there today, and it’s weird looking around and seeing bits and pieces of the past — a bird or two, flying around indoors instead of out; a hint of the old planters and outdoor area by the Sears shop; the area where the Newberry’s sign is. The Aladdin Restaurant (where we all were forced to have good manners), overlooking the ice rink. My great-aunts took my sister and me there once a year for a "fancy" dinner. And they loved Mannings, the coffee shop. It gave the oldsters a place to hang out and have coffee. My aunts lived nearby, and used to walk the mall every day, about. My sister and I loved Mr. C’s Hippopotamus, which was… over by where Azteca, which arrived later, used to be. Bob R, GREAT PHOTOS I was hatched back in 1966 and I still remember the rain in the mall the strong winds and that goofy looking spiral staircase. God I miss the good old days when the cops were the good guys you could trust and you could leave your car unlocked. Sorry I’m babbling. Since we’re tripping down memory lane, anybody with kids should read Beverly Cleary’s 1964 book "Ribsy" and see if they can recognize Lloyd Center. "…the shopping center, which was made up of all kinds of stores, shops, and restaurants, surrounded by acres and acres of parking space without parking meters. People came from miles around to shop here…"
"Rain was falling hard now, but Ribsy was dry, because there were roofs over the sidewalks of the shopping center.